Grad School recruitment advice. Personalized brainstorming. Unlimited reviews. The full-blown counseling package in which we offer personalized brainstorming at the beginning and monthly QnA sessions for doubts clarification. Plus, you get the exclusive career guidance session before beginning Grad School. You want to plan your career and go for the right program. You have a lot of questions. That’s why we created this package. This is the ultimate combination of application + internship/job coaching. Because it is not about just going to a school but building a fulfilling career. While most counselors focus on getting you admitted anywhere for now, we at Scholar Strategy look for your long term growth and career satisfaction. Therefore, we introduced a unique session on how to master the recruiting process in Grad School. This private webinar will cover the strategies for internship and fulltime job hunt alongwith proven interview tips. Maximizing your career prospects – With our CAREER MAP SESSION focused on how to prepare for internships and jobs in Grad School, you can start your career in USA more confidently. Want to study abroad and build a solid career? Come, work with us. Not so long ago, I experimented with digital nomad lifestyle – working from Bali, Auroville and Singapore. I met incredible people who are pursuing their dreams. As I explore the richness that meaningful life has to offer, I got thinking. What does a happy life entail? It is NOT just a degree. It is the exposure and experience you get as you travel along the path of life. And I have been fortunate enough to work on the biggest banks in New York as well as 8 people startup in the heart of Manhattan. I have been fortunate enough to carve a satisfying career. I want you to find your own dream story and live it. For me, it is bigger than just landing at Grad School. It is the career that you build and how you grow from there. Therefore, we are introducing a unique package – MASTERMIND – that combines our proven application strategy to get you into top schools with how to master the recruiting process in Grad School. You will be instructed on how to share your SOP, LORs and school list. Over a call, we will help craft your individual story for the applications. You will be instructed on how to create the first drafts of your SOP, LORS keeping your individual profile and goals in mind. Your SOP (same for LORs) will be reviewed in detail and comments will be provided for you to act on. Being engineers ourselves, we review not just the language but strategic content. Our students swear by our SOP reviews! You make the changes and resubmit the SOP/LORs for as many times as it takes to perfect them. We will leave comments on your school list about whether it is worth applying to that school or not. Also, we will suggest more/better schools if applicable. At the end, you have a much better SOP and LORs in your hand and a better school list. In our monthly QnAs, you will get to discuss the progress of your applications. This helps you stay on track and not get left behind. In April/May, after your results are out, you will attend the career map session where Nistha will guide you on how to prep for the placements. You get sample documents and advice for visa process. Why should I join Scholar Strategy counseling? We are not counselors, we are more like mentors. And we are building a network community between successful students and aspiring students. We believe that current students and graduates can offer best advice to prospective students – so why not build that community itself? When you take any package with us, you automatically become a part of this network and can access our contacts and resources. We would like you to avail these resources and once you come out with flying colors, give back to the community by being a mentor! But I’m already working with a local counselor? We are confident that our counseling is better than any local counselor. But if expense is your concern, you can look at our HIGH LEVEL ADVICE only package that proves to be a valuable resource to be used alongside other counselors. Your counselor might be good but he probably never studied abroad himself, so he can miss out on some critical tips and guidance that only we (or anyone who has gone through the process herself) can offer. What’s so great with your SOP reviews? Can you write the SOP for me? NO. We do NOT write anything for anyone. You write and we review. It is your unique language and story in the end. That is what makes this so good. If we started writing for everyone, imagine many people submitting same kind of SOPs! – you do not want that. Even if you end up working with any other counselor, do NOT let anyone else write your SOP. Wait, which city do you work in? We work everywhere, we work online 🙂 We have clients in India, Middle East and South Asia. So, your physical location does NOT matter. The whole counseling is conducted over as many phone calls, video chats, emails and text messages as it takes! By saving on physical logistics, we pass on our cost benefits to you by charging much lower than your local counselors. What if I want to get more essays reviewed? Some schools and programs ask for essays instead of or in addition to SOP. Add Rs. 3,000 (please check the latest rate on counseling page) if you wish to get other essays (apart from SOP) reviewed as well. This option is available in Comprehensive, Personal and Mastermind pckages. Other essays (up to 3) will be only reviewed once. We have found that once a student has crafted a good SOP using our tips, other essays are much easier to tackle. I’m sold. How do I enroll? We do not enroll anyone without talking to them first. And if we feel that we cannot help you, we tell you that right upfront. Please follow the steps on our contact page and schedule a call with us. On the call, we will walk you through the process. Why should I get Mastermind package instead of Personal package? Choose this if you need more personal brainstorming over applications as well as career placements help. Personal package provides shorter individual brainstorming for SOP but no placement advice. Do you help with filling application forms etc? Our forte lies in career advice and application strategy, and we are not the best visa/loan counselor. 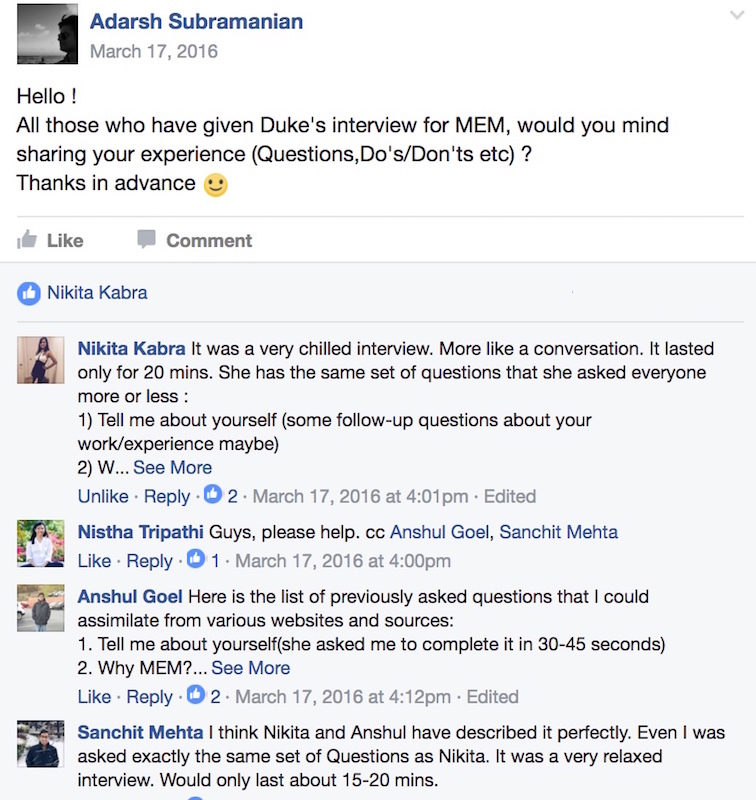 For more mundane queries such as ‘what should I fill in this field of application forms’, ‘is my funding source okay’, ‘what should be the format for this LOR’ – it is best to pick the brains of fellow applicants and seniors on our Scholar Strategy facebook group which is super active and helpful (see below). You can use the group as much and as long as you want but our counselor doesn’t help with filling application forms etc. Why should I get Personal package instead of Comprehensive package? Choose this if you need more personal brainstorming. Comprehensive package provides detailed guidance but NOT individual brainstorming for SOP, LORs and essays. There is NO personal interaction in Comprehensive package. Why should I get Comprehensive package instead of High Level? High Level package has NO LOR, school reviews or guidance. It has only 3 SOP reviews. What do you mean by ‘no personal interaction’ in Comprehensive package? There will be no calls or personal brainstorming, only emails and reviews in this package. This package does not help you in personal advice over ‘how to craft your story’ or ‘which program to choose if you are confused between MS, MIS, MSBA etc’. This package is for those who are clear on what they are applying for and what is their story and need only detailed review of the documents.